Iceman has to be one of my favorite X-Men. As a kid, I first discovered Iceman on the cartoon, Spider-Man and his Amazing Friends. Once I got into collecting comics, Iceman was a regular in the Defenders comics. But the local grocery store, where I bought my comics off of a spinner rack in the cereal aisle, rarely ordered Defenders comics. So I pretty much missed out on those stories as the series ended shortly after I began collecting comics. But I remember the day I found X-Factor #3. There he was on the cover along with Cyclops and Angel. I didn’t know who Marvel Girl was at that time since she had already died before I started to read comics and had just recently come back to life. X-Factor was originally a series that reunited the first five X-Men as a team once again. They posed as humans for hire to hunt and eradicate the mutant menace but were actually rescuing mutants and training them to control and use their powers. I often would buy whichever comic issue interested me at the time, but X-Factor immediately became one of the few books I began reading regularly (along with Uncanny X-Men and Peter Porker the Spectacular Spider-Ham). I became a huge fan of the book when Walt Simonson took over as regular artist. His dynamic storytelling and figure work along with his unique design style easily made him one of my earliest influences. 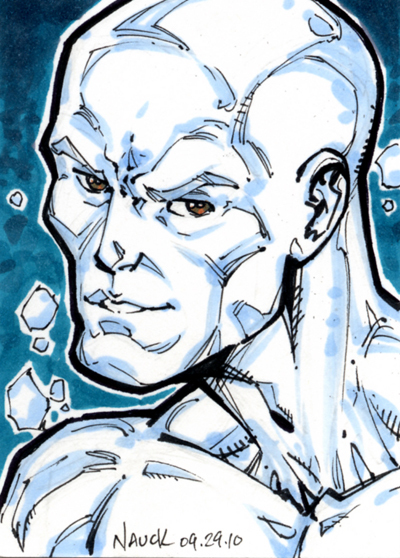 This entry was posted in Marvel, Sketch Cards and tagged comics, copic, iceman, marvel, pigma micron, sketch card, superhero, x-factor, x-men by Todd Nauck. Bookmark the permalink.